…They have always both whistled and swirled around these monstrous sands, for so many moons. …We can see Cave-Dwellings of Thamud and Iram. …The forestry there looks like Heaven. …Punished by Tornadoes, for they were bad. …Its coast is host to such rich aquatic-life; who knew this such beauty lies in such a harsh environment? …al-Ka`bah, where all Men come to visit, great and small. …But, Allah decided to name it al-Makkah. …No one could ever plan it better. …Such a wonder is their arduous tale. …At this very spot, they established Islam, rejoiced. …After being separated on Earth. …An example that, even in sin, we can acquire the Mercy of Allah. The 10-Days of Dhil-Hijjah: the best days of the year!!! During these 10-days, any/all positive actions, for Allah, the Creator/Lord o the Universe, are encouraged to do, based upon one’s ability, and this definitely includes making Hajj/Pilgrimage. However, if one isn’t able to make Hajj, they can most-definitely still do good works. Among the celebrated, encouraged, and most-highlighted good works, during these days, are Fasting. Now, unlike during the month of Ramadhan, Fasting is optional, unless there are days which must be made-up, for Ramadhan, or fasting because of a broken-oath, etc. One can easily use any/all of these days, from the 1st to the 9th of Dhil-Hijjah, to do make-up fasting. b. Fasting on this day is the compensation for not being able to make Hajj/Pilgrimage. This post is based upon the narrations of the history of the most important Islamic holiday, based exclusively upon the work, Qasas-il-Anbiya’ (Stories of the Prophets), by Abil-Fida’ Isma`il ibn-Kathir ad-Dimashqi. The story & history of the Celebration of Sacrifice (`Id-il-Adha) is such an important Islamic holiday, it is imperative that both Muslims & Non-Muslims know how this celebration became an Islamic holiday in the first place, and why it has such an important status in Islam. The story of the Celebration of the Sacrifice is based upon the stories of Abraham, Sarah, Hager and Ishmael (Peace be upon them). Imagine as a teenager, you’re given the greatest gift of all, guidance from Allah, through direct-revelation. Now, the only problem is that you live in a place where everyone except you worships other than Allah…how is one to deal with that? Well, those of us whom have accepted Islam can relate to this, in certain respects, to a certain degree. I mean none of us reverts are Prophets, or recipients of revelation from Allah. However, we have similar stories as Abraham, which is to decide whether to hold on to the guidance of Allah & turn against your own flesh-and-blood (as well as those whom you’ve known your whole life), or to oppose them in their rebellion against the oneness of Allah. Abraham decided to sacrifice the love of his father & people, in exchange for receiving the love of Allah, which never fades & is always sincere. And, this was not an easy thing for Abraham to go through: He faced being nearly burned-alive, by being catapulted into a blazing make-shift fire-pit, to be used as an example to not go against the grain, of not worshipping the pagan gods of his people, and without the protection of Allah, he surely would have been burned-alive. Abraham & Sarah were married for a long time; yet, unfortunately, they were not able to produce any offspring. So, Sarah, decides to suggest to Abraham to take another wife to marry. He chooses Hager, the once slave of Sarah, as his wife. She gets pregnant, with whom would soon to be Ishmael. But, Hager has decided to hide her own pregnancy from Sarah, to prevent her from becoming jealous of the fact that Hager was able to get pregnant, while Sarah was not. Unfortunately, this plan fails-Sarah is not a happy-camper. When she in fact does find out, she is very angry, it is made well-known how angry she is. Now, Abraham is literally stuck in the middle, in between the joy of being a father-to-be, with his new-wife & being in the “dog-house”, sort of speak, with his first-wife. So, after the birth of Ishmael, Allah decides to test Abraham, with a very important, yet heart-breaking test as well: Allah has made the decision for Abraham to abandon his new wife & child, and stay with his first wife, for the time being. Now, for any father, at least a good father, anyway, this would never, ever be an easy decision to make. But, then again, this is the Lord of the Universe telling you to do this, so you figure it out. Now, with this in mind, you have to at least try to appreciate what’s goin’ on here: He’s just had a baby, he has no idea where he is to send them, he has no idea how to tell Hager that Allah has commanded him to leave her, and he really has no idea, at the time, whether he’ll ever see either of them ever again. So, Abraham decides to take Hager & the new-born, the first-born of Abraham, Ishmael, on a road-trip. Now, obviously, unbeknownst to the two of them (Hager & Ishamel), they’re gonna be left for dead, in a short while. They approach a valley, in what is now known as the Arabian-Peninsula (modern-day Saudi Arabia). It is here where they are commanded to be left. So, once they stop, Abraham leaves them some food & drink, then, starts walkin’-off-Obviously a strange thing to Hager, she calls out to him; yet there’s no response from him. She then asks him whether or not Allah has commanded him to do this, and his reply is yes, he affirms that what he is doing is in fact a direct order from Allah. So, upon that, she encourages him to leave. However, there’s a great dilemma in the midst: She’s ran outta food & drink, really fast, Abraham is nowhere around and she has an infant whose hungry & cranky, from being hungry…what’s a gal to do? Well, she starts doing what any mother would do…she starts running around, to try to find some signs of food, water, life, something, anything, for her child & herself. And, ironically, just as though she had thought her plight had no solution, instantly, a spring of water gushed from underground, underneath the feet of Ishmael. Excited & elated, of course, Hager begins to make a make-shift well, to control/conserve the water. Just as she’s doing this, a flock of birds see them, both Hager & Ishmael, from way up high in the sky. They begin to fly around them, and guess what, they were looking for food & what not in the middle of this wilderness as well. And, soon enough, a nomadic tribe, known as Banu-Jurhum, were traveling through the desert (as is typical of desert/nomadic peoples), in search of water, food, etc. Now, they begin to see the birds, who are swimming around Hager & Ishmael. And, they figured to themselves that there must be someone or something there for these birds to just stop & fly around that particular location. So, naturally, they follow the birds, who lead them indirectly to Hager & Ishmael. They ask for water; but, Hager asks for something much more important: that they do not bring any type of harm to her or her son. They agree, and so does she & these people founded the well of Zamzam & the city of Makkah, together. Fortunately, some time later, when Ishmael becomes a pre-teen, basically, he, along with Hager, is reunited with Abraham-Sarah actually had a child of her own by this time; Isaac [Peace be upon him] had already been born. Abraham, Hager & Ishmael start to establish a beautiful relationship, and Abraham begins to make-up for lost-time, for not being there, for both Hager & Ishmael-Abraham & Ishmael had even built the Ka`bah & established the Hajj, together as father & son. Everything seemed like happily ever after. Yet, there’s still one more thing that Allah commands Abraham to do: He is commanded to kill Ishmael, to slaughter him as a sacrifice to Allah-Now if this isn’t a test, I don’t know what is!!! But, guess what? Abraham, being the Muslim, the Prophet, the man he is, falls in line and proceeds to set out to do what Allah has commanded him to do. But, this time, he does it differently. He actually tells Ishmael what Allah has instructed him to do. Now, any of us, regardless to much of a Prophet our fathers may be, if we were to hear anything remotely close to this, we’re gettin’ the hell outta dodge; however, let’s find out what Ishmael had to say about this. He tells his father Abraham, that he will endure whatever Allah has set out for him, and he will be patient (i.e. he’s willing to deal with having his young life snuffed out, simply because Allah says so). Now, this is what I call true faith in Allah, something that, unfortunately most of us will never achieve or acquire. But just then, as Abraham is about to strike the neck of Ishmael, with a sharp blade, suddenly, a ram appears, in a thorny bush, unable to escape, Abraham sees the ram, and immediately recognizes it as a sign from Allah, that this was only a test, to see how far he’d be willing to go to please his Lord, and he passed every single one of his tests, with “flying-colors”. I’ll go a lil’ deeper, for those who couldn’t make the connections for themselves-Since the term itself “`Id-ul-Adha” means the Celebration of Sacrifice (as was already, previously mentioned in this article), the stories which were detailed represent how far & deep a sacrifice can take a person, particularly & especially Prophets and/or family-members of Prophets. Abraham sacrificed a life of privilege & comfort among his people, Sarah had sacrificed her husband, and encouraged him to marry another woman, who was younger than she (to ensure that he could have a child), Hager sacrificed herself, possibly putting herself in danger, by agreeing with & encouraging Abraham to leave her & her infant-son, in the desert wilderness of the Arabian-Peninsula, Ishmael sacrificed his own life, to show dutifulness to Allah, then, to his father, a Prophet of Allah. We celebrate these great, righteous, persons, who sacrificed all that they had or wanted, simply to please Allah, the one who created them. And, Hajj (the annual sacred pilgrimage to Makkah, during the 12th month of the Islamic-Calendar, known as Dhil-Hijjah, literally meaning “the possessor of Hajj”), itself, is also directly tied into the origins of `Id-il-Adha. 1. The Zamzam water-well, possesses blessed water, which has quenched the thirst of untold millions of persons, whom have made pilgrimage, from the time that the spring was discovered, until the present-day. 2. The Ka`bah itself, the first building on Earth ever constructed, exclusively built, for the exclusive worship of Allah, originally being a simple altar, built by Adam (Peace be upon him), which is where the famous story of the sacrifices of Cain & Abel took place. After the great-flood, during the time of Noah (Peace be upon him), the altar, along with it’s foundation, were long-lost within the great sands of the Arabian desert. However, Allah (via His plan, which is greater than any & all other plans), had decided to bless Abraham & his descendants, with a Prophet from among them, long after his death, which is actually something that Abraham had actually asked Allah any way. This prayer was duly answered & that Prophet, from among the descendants of Abraham, was none other than Muhammad, the son of `Abdillah (Peace be upon him). 4. 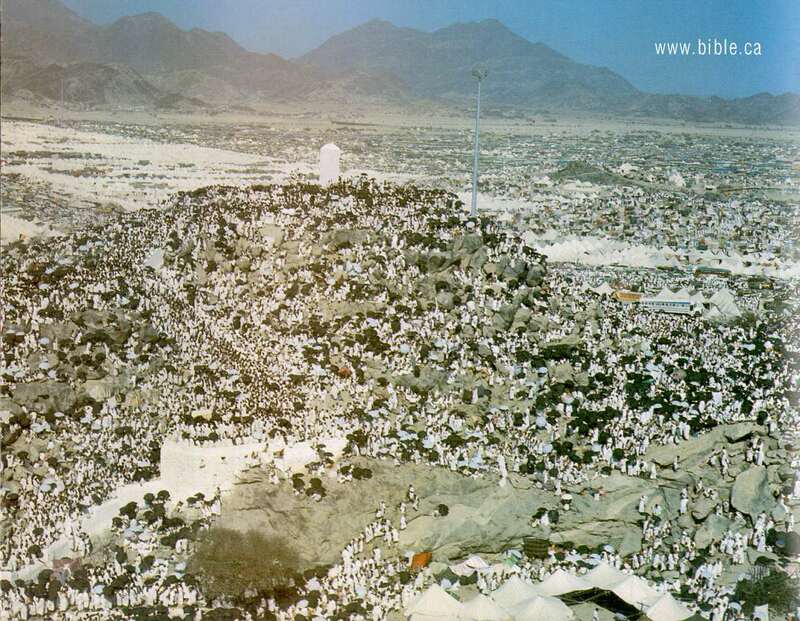 This place, where Hager was running to find food & water for her son & she, is actually in between the two mountain-hills of as-Safa & al-Marwah. She had ran back-and-forth, in between these two mountains, seven times. And, to commemorate her sacrifice of herself to find food & drink for her son & she, we, as Muslims, remember her, by doing this same back-and-forth running, in between as-Safa & al-Marwah, as part of the rites of Hajj, along with revolving around the Ka`bah, seven times, which was initiated by both Abraham & Ishmael, in commemoration of the building of the Ka`bah itself, as the very first building upon the Earth designated for the exclusive worship of Allah, the Lord of the Universe. And, this, in my conclusion, is the history of the origins of `Id-il-Adha, Hajj, and the promise of Allah, to Abraham, of making Muhammad a messenger from among his own descendants.